The EVA Park project team welcomed to City the group co-ordinators, volunteers and participants involved in the latest stage of the research, investigating whether support groups can be remotely delivered to people with aphasia after stroke. 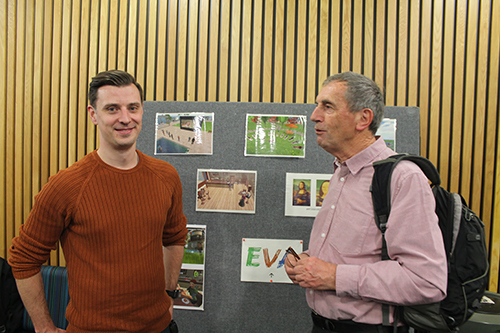 The latest stage of the EVA Park Project was recently celebrated at City, University of London. 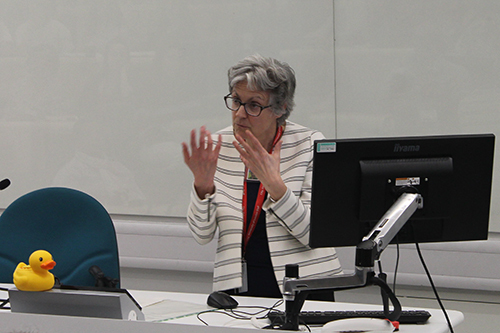 The project team welcomed others involved in the study, including group co-ordinators, volunteers, and participants, and representatives from the research funder, the Stroke Association. EVA Park is a multi-user virtual world which enables people with aphasia - a language disorder usually caused by stroke - to engage in conversation with support workers in a variety of virtual locations, giving them the opportunity to practise functional and social conversations and gain confidence. Examples include everyday conversations that most of us take for granted, such as ordering food in a restaurant, buying items in a shop or calling the police in an emergency. The EVA Park project is a collaboration between the University’s Division of Language and Communication Science (LCS) and its Centre for Human-Computer Interaction Design (HCID). During the latest stage of the project, the research team studied whether support groups can be remotely delivered to people with aphasia through EVA Park. Four groups each met in EVA Park over a six month period, led by a co-ordinator and volunteers. Each group involved up to eight people with aphasia. They received 14 scheduled group sessions in EVA Park, covering diverse themes such as living with aphasia, comedy and music. Users also had unlimited independent access to EVA Park. 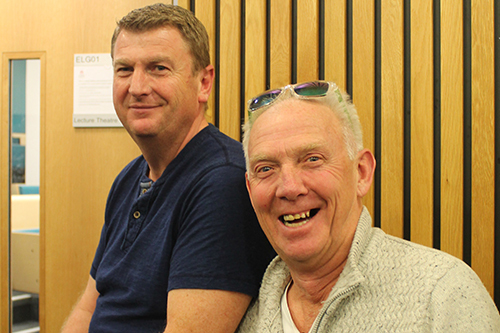 'We aimed to find out if the support group intervention was feasible and acceptable, both to those who received it and delivered it, and whether it had an impact on users’ communication, wellbeing, feelings of social connectedness and quality of life. We were also interested in how much the intervention costs. We found that it was possible to deliver group social support in EVA Park. Those who received and delivered the intervention were positive about their experiences and described perceived benefits. There were also difficulties, for example with aspects of the technology. We could not show that the intervention changed scores on our outcome measures. This could reflect the content of the intervention and the relatively low number of sessions, rather than the delivery mode. Other highlights included Niall discussing his experience as a user of EVA Park, and how he’d used his skills as an editor to make the latest EVA Park demonstration video (above). When I first started here [with the EVA team], a year and a half ago, I couldn’t really speak much at all, and for some unknown reason I used to find it much easier talking through [EVA Park] , or to people on here. It was much better because its low stress. It really was very good, and I always remember the duck, and the woman?.. The mermaids. You can go down in the water, you can dive in there. So it’s very low cost, low stress and that’s what makes it easy. I thought it’s been really very useful.